Mission, vision, and values statements provide the bedrock guiding principles of any organization, including for-profit businesses, non-profit organizations, trade associations, and governmental agencies. The ideas and beliefs that guide organizations are always important, unique, and interesting, which is why we enjoy this type of work so much. We don't tell you what your mission, vision, and values statements should be; rather, we elicit your ideas, goals, and principles. Then, we help you distill your collective thoughts to create guiding statements that capture the core of what your organization's purpose, aspirations, and values. The process is enjoyable, efficient, and we use proven techniques. We strive to finish in a impressively short amount of time. 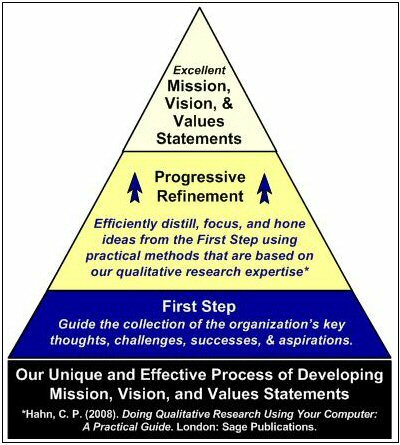 We include your operational challenges and successes when we collect your ideas that are the foundation of the mission, vision, and values statements, but operational planning is a next step, and not necessary to the mission, vision, and values process. When requested, we apply our unique processes to the next level to create and refine operational plans. But unless solid guiding principles are in place, operational plans may drift off course. Please contact us to discuss the needs of your organization. There is no charge for an initial consultation. The consultation may be on the phone, or you are invited to meet with us in Bozeman, Montana. We generally limit our services to those in the Western United States. Christopher Hahn, Ph.D., MBA, has held corporate management positions at all levels. His Ph.D. in Human Services was earned after his life in active corporate management. The focus of his doctoral study was on constructive consensus-building in challenging situations. As a post-doc project, he published a graduate-level research methods textbook for Sage Publications. He currently works in various settings as a facilitator, professional mediator, and consultant. This includes work as a facilitator/mediator with the Montana Supreme Court. When he was in corporate life, he worked as negotiator of land, environmental, and water issues for Conoco and Homestake Mining Company. Chris is an innovator and was co-founder of Digital Integrator, Inc. (Hahn, et al., software patent for real-time data integration). He combines his broad experience to conduct goal-oriented team-building exercises using proven methodologies. Dr. Hahn's Bachelor's Degree is in Geology - his MBA included an emphasis on economics - his Ph.D., in Human Services, culminated in his dissertation on successful consensus building in difficult circumstances. Contact: chris@constructiveagreement.com, (406) 522-4143. Brigadier General Kendall Switzer, USAF (Ret. ), Kendall Switzer has over 32 years of leadership experience in successful, high performance intuitive cultures. A U. S. Naval Academy graduate, Ken served as an F/A-18 Pilot, Instructor and Leader in the United States Marine Corps with combat fighter squadrons throughout the world. Ken is a TOPGUN graduate, former Naval Strike Warfare Instructor and Blue Angels demonstration pilot. Ken also served in the United States Air Force/Air National Guard as an F-16 Pilot, Instructor and Commander, both in peace time and in combat. These experiences further refined Ken's grasp and application of the Intuitive Development and Teamwork concepts. Ken's experience is not limited to the military. He has over ten years of experience leading in the construction industry as well as over 4 years as a leadership/ performance trainer and coach in the Oil, Gas and Mining Industries. Contact: teamworkbythumper@gmail.com, (406) 581-4990.